Consumers across the globe are warming up to proximity mobile payments. In 2018, for the first time, more than one-third (34.9%) of smartphone users ages 14 and older will use a mobile phone to pay for a purchase at a physical point of sale (POS) at least once every six months. Most proximity mobile payment user growth worldwide will be driven by the expansion of the big three global providers—Android Pay, Apple Pay and Samsung Pay—as well as Alipay and WeChat Pay. Growing retailer acceptance of mobile payments and spreading smartphone usage will also fuel growth. Asia-Pacific will have the highest proximity mobile user penetration rate among smartphone users (roughly 50%) throughout the forecast period, due mainly to China. Looking at the usage among the total population, however, Asia-Pacific is on par with North America, at about 20%. This is because smartphone usage, particularly that of more advanced devices, is more common in North America. Adoption in parts of Western Europe has been held back by strong contactless card usage. Consumers appear less likely to tap and pay with their mobile phones when their credit and debit cards already offer a similar level of convenience. 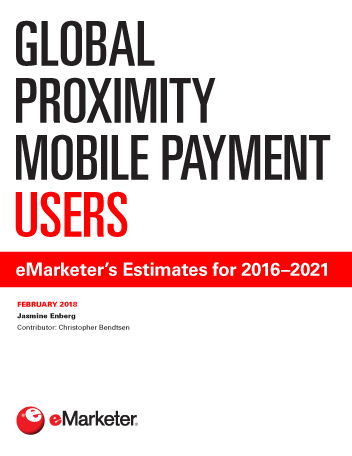 "eMarketer expects the number of proximity mobile payment users worldwide will rise by double digits through 2020, when it will surpass 1 billion people for the first time."